Should be able to get under 17.5secs at 4GHz. 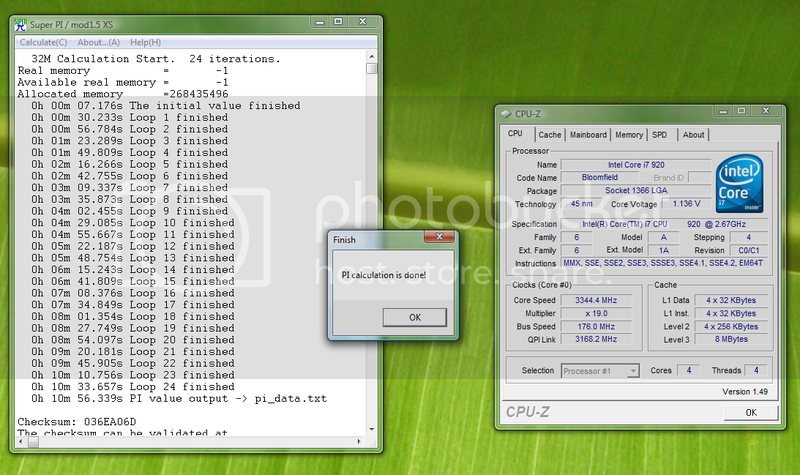 Sorry for the Dialogue box covering cpuz, didnt realise until I'd rebooted, I didnt wanna sit at 1.5v for too long! 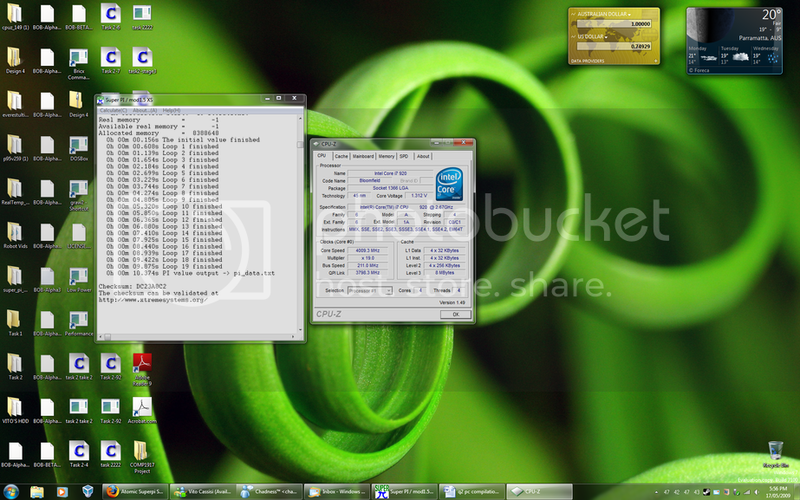 From my skills of win, this was at 480 x 9.5 = 4.56GHz. Very nice, what did you do? Tight timings? c0nc0n how do you know his OC speed! Here is my new one with my new E8600, 2 minute bench. 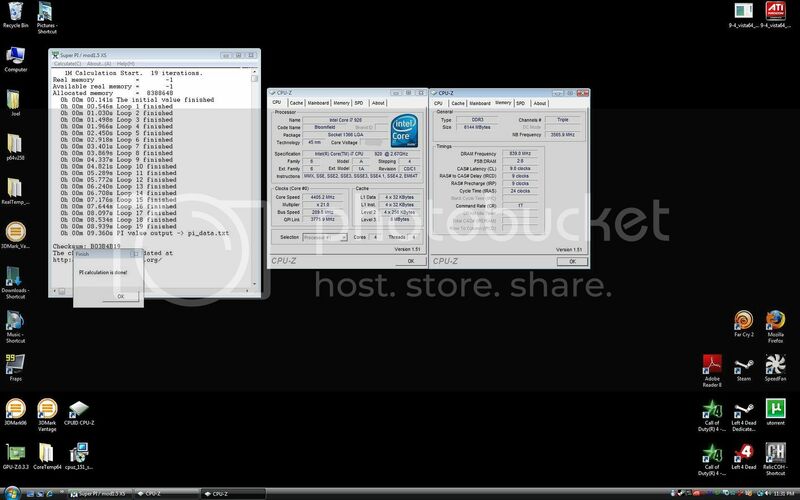 Using stock voltages and cooler, apart from the vCore which has been undervolted. Clean unmodified Vista Ultimate install. Edited March 5, 2009 by .:Cyb3rGlitch:. 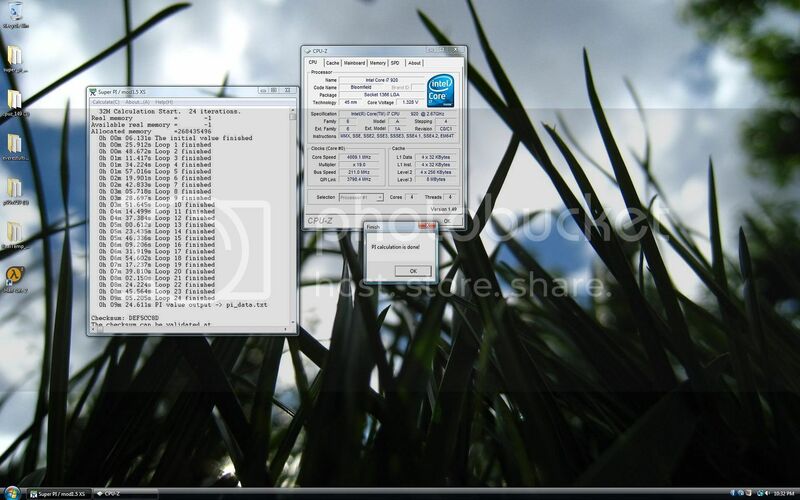 Overclocking i7 sounds complicated to me but I look forward to seeing what you do with it if you go that way. Once my TRUE comes in, I'll try both at 4GHz and HT. I'd like to register my first score. Its not really tweaked so there is something to aim for .:Cyb3rGlitch:. PC FREAK - Sorry mate but I can't accept that screenshot. I need to be able to see the checksum at the end of the SuperPi run and CPU-Z needs to have the cpu tab open. If you want to show RAM timings etc just open another instance of cpu-z to show the other tab at the same time. Please redo if you can. Windows 7 RC1. Pretty snazzy. Figured you all need to aim a bit higher, this is still beatable using an E0 e8x00 chip especially since this was on an old vista install with unoptimized ram timings and without hyperthreading. I find that SuperPI isn't fussy about how old the OS is. I don't think HT will do anything either. running a fresh install of XP over an old install of vista I found to make about ~.5seconds difference. Is that a 24/7 overclock, or a one off?